Come experience the relaxed casual atmosphere of our little micro-brewery. Set amongst natural bush with loads of birds, we are on the (not pink) Pink Lake side of the spectacular Great Ocean Drive 12 km west of the centre of Esperance. Relax with friends while enjoying tasting the local brews. 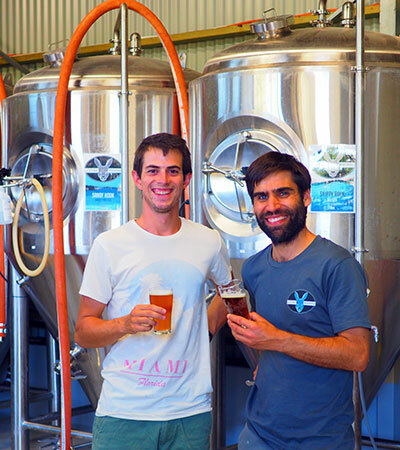 Lucky Bay Brewing is a family friendly production facility, which means you can enjoy the full selection of our brews in 100ml tasting paddles, and take your favourites home in freshly filled 1L big cans or the impressive 2L stainless steel refillable ‘growler’ flasks. 19L and 50L kegs with dispensing gear are also available. Basic snacks are available, or feel welcome to bring your own nibbles to enjoy with your tastings. Tasting paddles of the genuine uniquely local beers from Lucky Bay Brewing are a real treat. Brewery tours are also possible by pre-booking. A tour is a fantastic way to learn all about the magic of brewing beer, while tasting some brew treats and the end product! Contact Nigel on ph: 0447 631115 for details and to book. Group bookings outside of normal open hours are possible. Children and pets are welcome at Lucky Bay Brewing…please keep your dog on a lead as our chickens, rabbits and kangaroos are not on the menu! Unfortunately we are not able to serve middy’s, pint’s or food at our current venue due to the licence restrictions put on us by the local and state goverment’s (we’ve tried!!). So we are planning to move our brewing facility to a new venue in the next 2 years… until then enjoy tasting paddles and takeaways of our genuine uniquely local beers in the lovely space we’ve created for you at Lot 16 Barook Rd, Esperance, which is also our home 🙂 . And if you have an idea for a new venue please let us know!